If you recall, we had wanted to spend an extra day diverting to the Forth bridge, Edinburgh. We left at 060o after the Arbroath Marina staff had opened the lock gates specially for us rather than delaying us until their scheduled 1400 lock out. Mark W and I dutifully slipped at 0700, dodged the creel pots scattered across the entrance, then we had a delicious sail with the the genoa reefed in a 25 knot wind. We sped along and forgot the windless motoring done so recently. We averaged 7 knots SOG for around three hours while the wind rose and blew about 40 degrees off the nose. But then, as we rounded Fife ness to enter the Forth we were forced to motor into the light headwind. However, what we did not know at that time was the amount of time spent motoring in a benign sea, about half an hour, compared with the horrible remainder of today's passage. 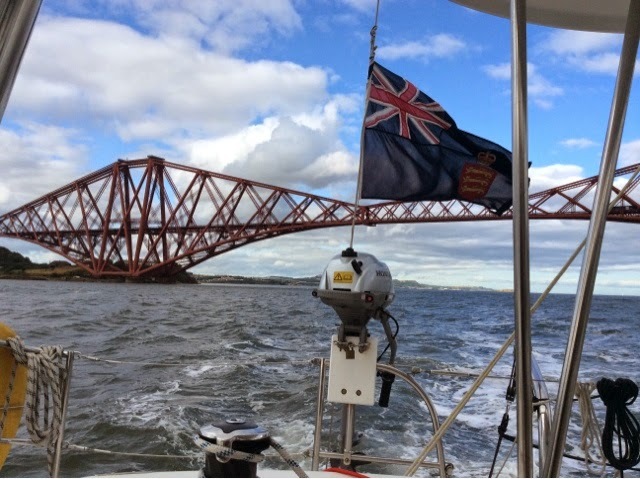 We eventually spent about five hours motoring up the Forth to go under the famous Forth bridge. It is absolutely vast. Photo attached. The bridge was exceptional, and worth the time and considerable discomfort. Matthew has joined us which makes me very happy. Having arrived at Port Edgar after a five hour thrashing, we were shaken not stirred, and Matthew arrived a short while later. We ate locally at a small bistro in the very pretty town which had an amazing view of the bridge, then returned to the boat. Tomorrow, we intend to leave from Port Edgar to Eyemouth, only about 60 nm., and hope that the wind behind us and abeam of us will be as kind to us, as the cold 30 knots headwind was challenging today.